LiveWorkPlay is a Canadian charitable organization supporting people with intellectual disabilities to have a good life in the Ottawa area community. 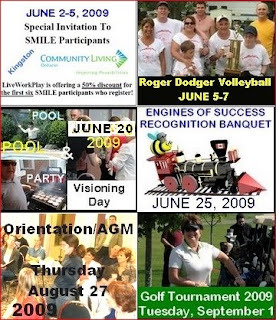 LiveWorkPlay is an affiliate of Community Living Ontario. The LiveWorkPlayNews is a monthly email and blog communication. Please scroll to the bottom for subscription and contact information. 1) THE AWARD GOES TO: LUCAS! 6) JOIN US AT THE HOSTA BEE! The first annual Better Together Heartwood House banquet on April 23 was a very special evening for the 165 in attendance, including dozens of members of the LiveWorkPlay community. Heartwood House is an umbrella charitable organization, providing a home for 15 non-profit groups at 153 Chapel Street. The banquet activities included the presentation of the Mike Ward Memorial Award. Mike Ward came to Heartwood House and found a home as a dedicated volunteer. 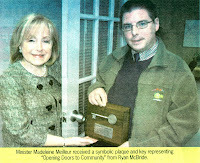 He passed away in 2006 but his legacy lives on through the award given in his name, presented annually to a Heartwood House community volunteer that exemplifies a welcoming spirit and willingness to help others.The winner of the inaugural award presented April 23, 2009, was Lucas Rogers. 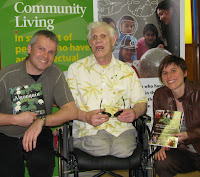 Lucas was introduced to Hea rtwood House in 2001 through his long time connection with LiveWorkPlay. He received many glowing comments, some of which you can read by clicking here. LiveWorkPlay's CEO Keenan Wellar, currently the Chair of the Heartwood House board of directors, was one of the nominees for the other major awards of the evening, the Heart of the House award, created to recognize a giving and sharing person that exemplifies community spirit. The award went to Gillian Gailey of the Aphasia Centre of Ottawa, who has always been a tremendous friend to LiveWorkPlay, and a very welcoming presence for people with intellectual disabilities. Gillian is famous for her crowded office at the side door where she always finds time to be a good neighbour to anyone and everyone who passes by. 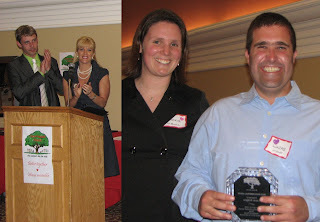 The event was hosted by Derick Fage and TL Rader from the Daytime televison show on Rogers 22 and the award was presented to Lucas by Jackie Swedlove from the Heartwood House board of directors (pictured above). We hear you. There is a lot going on at LiveWorkPlay and sifting through all the information to keep track of deadlines and complete registrations is diffic ult. It's also very difficult for event organizers to do their job when they can't figure out how many people are coming in time to make appropriate arrangements. Everything you need to know is now just one click away. Our home page at liveworkplay.ca now features a prominent EVENTS banner. After you click on that banner, everything is at your fingertips. Just click on the picture of the event you are looking for to register. As you can see from the banners to the right, there are many exciting LiveWorkPlay events coming up in the next few months. Please register as soon as possible to help LiveWorkPlay make all of our events the best experience possible for all concerned! The month of May is Community Living Month. The federation of more than 110 local associations will be hosting a variety of awareness activities across the province. Many of these events resemble activities that LiveWorkPlay traditionally u ndertakes in the month of June. Next year events like the Engines of Success recognition banquet may move to to May to coincide with celebrations at other Community Living Ontario affiliates. LiveWorkPlay was a very active member of the federation throughout March and April. This included hosting an End of an Era event and organizing public awareness about the closure of Ontario's mass institutions for people with intellectual disabilities, attending the annual meeting of associations in the eastern region, and contributing to a special "After The Closures" retreat in Gananoque. Although it was not a Community Living Ontario event, the "A Home That's Right For Me" forum in Ottawa on April 28 featured many familiar faces from the federation. Some of the most impressive innovations in supporting a good life for people with intellectual disabilities are coming from local Community Living associations across the province. The evening following the forum LiveWorkPlay co-founders Julie Kingstone and Keenan Wellar were honoured to assist in facilitating an End of an Era event hosted by Community Living Upper Ottawa Valley, which took place in Pembroke. Pictured right, Julie and Keenan accepted lovely gifts and got to meet a number of individuals who have moved from institutions to the community, including Bob Gangon (centre). Congratulations and special thanks to Caroline Matte, Jennifer Harris, and Ryan McBride who took part in many of these events and activities as self-advocates and long-time members of the LiveWorkPlay community. Caroline and Jennifer are just two of the expected six self-advocates who will be attending the Community Living Ontario 56th Annual Conference in Kingston, June 3-5. A limited number of discounted registrations are still available, but please sign up quickly! The annual LiveWorkPlay Open House is another event that might move to the month of May in future, but for 2009 it took place on April 17. More and more of our work involves supporting people to enjoy a good life in community settings. It's all about workplaces, homes, and relationships, so there isn't all that much to see on a physical tour these days. But the Open House remains a useful means to introduce people to the organization. 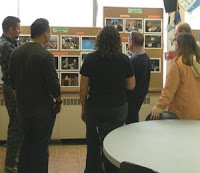 This annual event is mainly about telling stories to help people understand the LiveWorkPlay approach. Special thanks to Caroline, Ryan, and Laura Stewart for assisting in welcoming potential new members and the general public at this year's Open House. Journeys is winding down for the year with only a month of Friday night adventures remaining. Everyone is looking forward to all that the Ottawa area has to offer in the spring season. 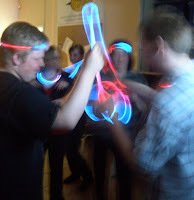 The annual Journeys dance party (pictured) was one of the highlights for April. Just as Journeys comes to an end for 2008-2009, ACES looms on the summertime horizon! ACES offers a unique summer learning opportunity by involving teens with intellectual disabilities in planning and enjoying an overnight trip. This year there are two separate trips to Toronto. We can't tell you want they will be doing, because nobody knowns just yet - much of the itinerary is up to the individuals concerned. The Garden Fairy (aka Marlene) has organized a new fundraiser for LiveWorkPlay. 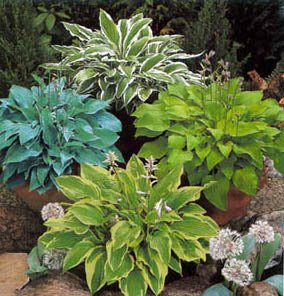 A huge supply of hostas, lilies, and other assorted perennials have been donated by local gardeners. Volunteers from Bank of America and T he Garden Fairy are joining forces on Tuesday, May 5th to divide and dig out these plants for the Saturday sale. All proceeds will be donated to LiveWorkPlay. Rain or shine, the plant sale will take place at 15 Pineglen Crescent near Hunt Club and Merivale see http://tinyurl.com/hostabee for map and directions! If you are interested in helping out with the sale by donating plants of your own or serving the public, contact Keenan who will put you in touch with Marlene. If you would like to make a donation to LiveWorkPlay, please click here. We hope you have enjoyed this 29th edition of LiveWorkPlayNews. If you have received an email about this blog in error and/or you would prefer not to receive future LiveWorkPlayNews messages, simply click here and follow the simple instructions. That same web page can also be used by newcomers who would like to join LiveWorkPlayNews, so feel free to share the address with friends, colleagues, and family who might like to subscribe. Send story ideas to Keenan Wellar.